Ahmadinejad Tells Activists He's "Anti-Capitalist"
Ahmadinejad Tells Activists He’s "Anti-Capitalist"
Nader Hashemi: While Iran’s democratic movement tries to discourage US military intervention, Ahmadinejad gives fuel to the fire. Oct. 12 - TRNN On September 21, Iranian President Ahmadinejad called a conference with representatives of American anti-war organizations and Iranian activists to discuss the situation in Iran, and facilitate peace between the two countries. In an interview with The Real News, Nader Hashemi, author and Assistant Professor of Middle East and Islamic Politics at the University of Denver, said that the anti-capitalist rhetoric is only a strategy to win sympathy and invalidate the the US and Israeli cause to exert military power over Iran’s nuclear program. “I think it's an exercise in hypocrisy. I mean, one has to understand that within authoritarian societies in the Middle East, the fundamental issue that matters for ruling elites is maintaining political power. And so they will invoke any argument, whether it's in favor of capitalism or socialism, to rally opinion, whether globally or internally, in order that these ruling elites remain in power,” he said. Hashemi said Ahmadinejad is currently trying to remove subsidies from basic commodities such as bread and gasoline, that insulate the working class, in order to free up government money for uses that will entrench its power. He said those sections of the economy are run as private businesses, for the private benefit of the Revolutionary Guard. “Yeah, it's moving in the direction of a sort of a Pakistani sort of military model where, to the extent that you are allied with the military forces, in this case the Revolutionary Guard, the more that you'll have access to economic opportunity without any checks and balances,” he said. However, despite discussion by Israel, the US, and recently Canada’s former minister of justice Irwin Cotler about the need for human rights and democracy within Iran, Hashemi said it is primarily to build a case for regime change, and for military action by Israel and United States. He said the pro-democratic movement in Iran is strongly opposed to “the language of force” and say a military attack on Iran would undermine the internal struggle for democracy. He said that Irwin Cotler, and those that advocate for regime change and military intervention are not serious about human rights, but are motivated by bias toward the state of Israel and the desire to keep Iran from weaponizing their nuclear program. Rather than creating an opening for democracy, he said, destabilizing the regime with military action would give Ahmadinejad an excuse to take extreme protectionist measures, and extinguish the pro-democracy movement. He said the democratic movement within Iran would seek sanctions that put pressure on the ruling elite without starving the average Iranian. “[The democratic movement’s] view is that they oppose broad-based sanctions that affect the average citizen in Iran, but they are supportive of carefully calibrated and targeted sanctions that focus on specific individuals who've been guilty of human rights violations,” he said. Senior Editor of The Real New, Paul Jay, got the chance to speak with peace activists who had attended the conference. They told him that their intention in meeting with President Ahmadinejad was to reduce the justification for military intervention in Iran by facilitating an effort by the president to discuss the issues. They emphasized that their main strategy to support the democratic movement in Iran was to discourage US and Israeli military intervention. Unfortunately, Hameshi said, Ahmadinejad's defiant rhetoric is actually making it much easier for the United States and Israel to make a case for attacking Iran. PAUL JAY, SENIOR EDITOR, TRNN: Welcome to The Real News Network. I’m Paul Jay in Washington. And in New York on September 21, 130 members of what was described as representatives of the American peace movement met with President Ahmadinejad on the day declared by the United Nations the International Day of Peace. President Ahmadinejad exchanged views with the representatives of the peace movement about the current situation, particularly around threats to Iran through US or perhaps Israeli military power over what they claim is an Iranian nuclear weapons program. In the course of the discussions with the peace representatives, President Ahmadinejad had this to say: "’Violent capitalism is based on superiority, hegemony, and violation of rights.’" Apparently, "[h]e went on to say that one reason the capitalists start wars is to fill up their pockets. They must empty their arsenal so they will build more weapons." And then, earlier that day at the United Nations, he’s apparently said: "Capitalism has come to an end. It’s reached a deadlock. Its historical moment has ended and efforts to restore it won’t go very far." This [was] all reported by Fight Back! 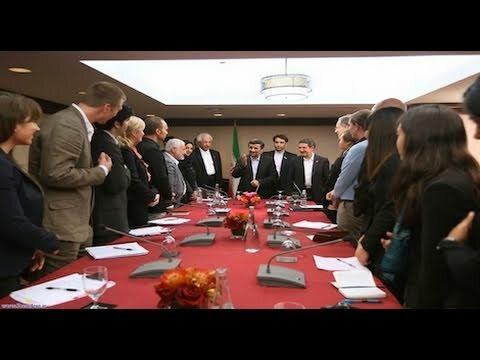 News, one of the organizations that was invited to meet with President Ahmadinejad. Now joining us to discuss the remarks of President Ahmadinejad is Nader Hashemi. He’s an assistant professor of Middle East and Islamic politics at the Josef Korbel School of International Studies at the University of Denver. He’s coeditor of the upcoming book The People Reloaded: The Green Movement and the Struggle for Democracy in Iran, which will be available in 2011. He joins us now from Denver. Thanks for joining us, Nader. NADER HASHEMI, ASST. PROF., MIDDLE EAST AND ISLAMIC POLITICS: I’m glad to be with you. JAY: So, presumably, the peace groups met with President Ahmadinejad because they want peace. They’re opposed to the threats by the United States, particularly Israel, in regards to military action against Iran. They’re opposed to sanctions that—if I understand it correctly, the sanctions will affect a broad width of the whole population of Iran. What is your view as someone who’s been supporting the democracy movement? And what does the democracy movement in Iran—what’s their view towards sanctions? HASHEMI: Their view is that they oppose brought-based sanctions that affect the average citizen in Iran, but they are supportive of carefully calibrated and targeted sanctions that focus on specific individuals who’ve been guilty of human rights violations. JAY: We’ve heard from within Israel a lot of talk about human rights violations in Iran. There was a press conference about a month ago—Irwin Cotler, who’s the former minister of justice of Canada, was there—talking about human rights violations in Iran, linking it to the weapons program. And they’re starting to build a case for regime change, and also for military action by Israel/United States, not only under the rubric of nuclear weapons but under the rubric of human rights violations. So how does the democracy movement deal with much of what they say winds up being used by Israel and the United States? HASHEMI: Well, it sends a clear message to those people like Irwin Cotler, who’s in favor of military action against Iran, that if he’s really concerned about human rights and democracy in Iran, then he will listen to those pro-democratic forces and those leaders who strongly object to the language of force, the threats of a military attack on Iran that would undermine the internal struggle for democracy. So I don’t think Irwin Cotler’s being serious when he claims that he wants human rights in Iran. I think his views on the subject are determined, really, by his bias toward the state of Israel. JAY: Now, the argument they give is that a military action will so destabilize the regime, it creates an opening for the democracy movement. HASHEMI: Well, actually, if that were to happen, exactly the reverse would be the outcome. The regime in Iran would be strengthened. They will be able to declare a state of emergency, arrest thousands of people, perhaps execute thousands more, and completely crush and eradicate the pro-democracy movement. And if you’re serious about human rights and democracy in Iran, you have to listen to the internal leaders within Iran, who completely repudiate the politics of people like Irwin Cotler and those people who are in favor of military action against Iran here. JAY: Well, let’s go back to the meeting that President Ahmadinejad had with the 130 peace activists. And, again, here’s a little bit of what he had to say there: "Violent capitalism is based on superiority, hegemony, and the violation of rights. Capitalism has come to an end. It’s reached a deadlock. Its historical moment has ended and efforts to restore it won’t go very far." So the president seems to be positioning himself, or trying to, with Evo Morales from Bolivia, Hugo Chávez from Venezuela. This idea that he’s part of this broad anticapitalist front that’s been developing, particularly in Latin America, what do you make of that? HASHEMI: Well, I think it’s an exercise in hypocrisy. I mean, one has to understand that within authoritarian societies in the Middle East, the fundamental issue that matters for ruling elites is maintaining political power. And so they will invoke any argument, whether it’s in favor of capitalism or socialism, to rally opinion, whether globally or internally, in order that these ruling elites remain in power. And so I think that’s really what’s going on with respect to Ahmadinejad. JAY: Some of the people suggest that the kind of struggle Ahmadinejad’s having with, for example, Rafsanjani, who we know is more or less a billionaire and has investments in Western hotel chains, but that fight represents a kind of fight for a state socialist sector versus the private monopoly sector, and Ahmadinejad represents this kind of populist fight for the poor. Is there truth to this? HASHEMI: Oh, that’s the mythology. Let’s look at what’s happening right now, today, in terms of Iran’s internal economic policies. The big debate in Iran right now is that Ahmadinejad is trying to pass through Parliament legislation that will remove subsidies from basic commodities and products, things that the average poor person needs to survive on — bread, gasoline, wheat, etc. And the reason why he’s doing that is because Iran’s economic house is in a mess, and he wants to reduce subsidies so that the government will have an influx of cash that it can then spend as it pleases in order to entrench its own power. So if you really think that, you know, Ahmadinejad is this sort of socialist political actor who really cares about the poor, one has to square that with his current policies of reducing subsidies on basic products. Moreover, there’s a whole question of workers and unions. As I speak, one of the most famous and prestigious union leaders in Iran, Mansour Osanlou, has been put in jail, severely tortured. And there’s no such thing as an independent trade union in Iran. So those people who think that Ahmadinejad is this wonderful socialist who cares about the plights of the poor and the workers really need to familiarize themselves with, you know, basic facts about internal Iranian politics. JAY: It’s not really about one guy anyway, whether it’s Ahmadinejad or someone else. In terms of that section of the clerics that’s in power and the supreme leader, what is their role in the economy and Revolutionary Guard? I mean, to what extent do they represent public sector? To what extent are they allied with their own group of Iranian billionaires? HASHEMI: Oh, it’s a good question, and I think it boils down to a struggle to maintain political control. The ruling elites in Iran, the ruling clerics, have basically given a huge section of the economy all to the Revolutionary Guard and has allowed them to sort of run private businesses, private economic interests, without any checks and balances, so that they will feel invested in the ruling regime and not decide to switch sides to the green movement. And so what’s really happening is there’s no really deep economic sort of political philosophy or ideology at stake here, except a form of Mafia-style politics, where the ruling elites have sort of divided up the economy among themselves, and they’re hoping that that will maintain their control and maintain them in power over the long term. JAY: So is the role of the state sector and the Revolutionary Guard in Iran, I mean, is it more—anything like a Bolivia model? Or is it more like a Pakistan model, where the army is very involved in the economy but it doesn’t have much to do with the interests of ordinary people? HASHEMI: Yeah, it’s moving in the direction of a sort of a Pakistani sort of military model where, to the extent that you are allied with the military forces, in this case the Revolutionary Guard, the more that you’ll have access to economic opportunity without any checks and balances. So I think, you know, the analogy with Pakistan, its military, is really bang on. That’s where Iran is heading. JAY: So when I asked some of the people that were at the meeting, some of the peace activists who were at the meeting with Ahmadinejad, you know, about some of these issues, I said, well, do you not feel some sense of solidarity with the people in Iran fighting for democracy? And the answer I got from a couple of them was that we can’t do anything about that. What we can do is try to mitigate US policy. And by not demonizing President Ahmadinejad, you know, having a meeting with him, it helps to reduce this kind of threat of military attack on Iran. And the issue of the democratic rights, they say, is so used by the US and Israel that it’s—really doesn’t help the defusing of the military threat for the American left or American peace movement to be involved in that piece of the issue. What’s your response to that? HASHEMI: I can understand the sentiment. But it’s important here that one not put all your eggs in one basket. In other words, if you’re really concerned about, you know, the future of our world, US-Iran relations, the threat of another war in the Middle East, I think one has to strike a very careful balance between imperialism and fascism. In other words, it’s important that people in the United States, peace groups in the United States, rightfully try to oppose aggressive predatory US policies toward the region, in this case Iran. But at the same time, it’s important that you don’t lose sight of what’s happening internally and then ally yourself with Ahmadinejad as if he is somehow a representative democratic leader who wants what’s best for his people. I would make the argument that Ahmadinejad’s bombastic rhetoric is actually making it much easier for the United States and for Israel, right-wing forces in both those countries, to make a case for attacking Iran. And if one was really worried about preventing greater war, those forces within the peace movement would then try and, you know, listen more closely to what’s happening internally within Iran and listen to Iran’s pro-democracy movement, which, by the way, is no way in favor of some sort of US-style sort of military strike, violence, turning Iran into some sort of satellite regime. The pro-democracy [movement in Iran] is very nationalistic. It’s very in favor of, you know, international law and a just sort of set of international relations that I think most people in the peace movement would rally towards and accept if they would only take the time to familiarize themselves with what’s happening internally inside the country. HASHEMI: Glad to be with you. Thanks.